What is appealing of a risky lifestyle? Surely the demonstrative cord clamping in the childhood. But one also sends the signal of not appreciating oneself. Otherwise you would take better care of yourself. Fellow humans have a good sensibility for this. Superficially it might seem cool to live above your means but really it makes you unattractive as a partner because you are not handling your resources with care. That doesn’t just apply to material things. Health is capital just as much. Even if at your age this might not seem to be playing a role in your life. Don’t be mistaken – at least unconsciously it affects your attractiveness negatively. Through smoking the skin gets out of balance. Some of the substances of the complex mix of chemicals in cigarette smoke have direct effects on the functions of the skin. They are true zit-boosters. If you stop smoking your skin will regenerate relatively quickly. The carbon monoxide contained in the cigarette smoke impairs the blood circulation of the skin. The effects aren’t just the noticeable aging but also, for example, a slower healing of wounds. You’re proud of your hair? Then take care of them. The hair of smokers looses gloss and fingertips and nails as well as teeth stain visibly yellow. Smoking poses a big danger if you’re taking the birth control pill. Smoking raises the risk of thrombosis for pill users to 300% in comparison to nonsmokers. In order to insure that peelings and face masks don’t become relevant to you soon, you can take a look at what you are saving yourself from by not smoking. Of course this app can’t predict the future but what Titus Brinker and the other students were thinking is very graphic. And entertaining enough for a party gag. 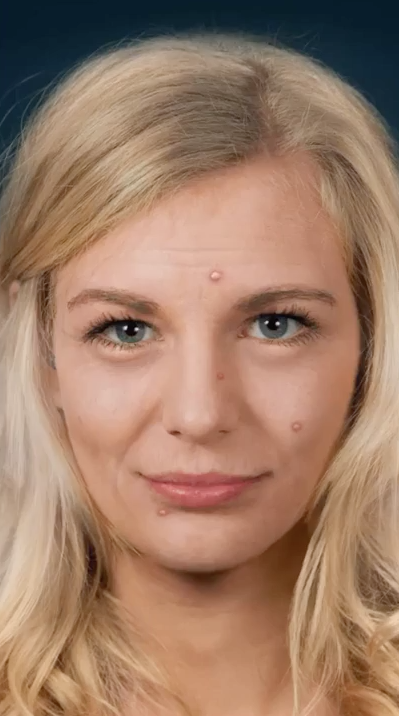 N24 has a youtube video, that shows the practical test of the app and this is what you could look like in 15 years.